Pediatric palliative care clinicians care for children with life-limiting illnesses – ranging from the unborn child through to young adulthood. 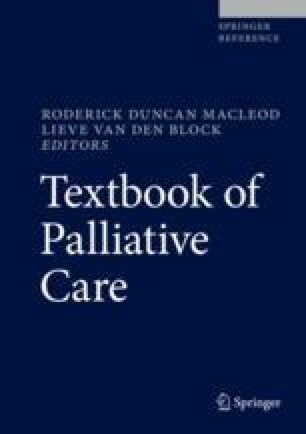 It is a unique specialty that shares some concepts with adult palliative care but also important differences. The range of diagnoses, illness trajectories, and prognoses are very different to the diseases of adults. In addition, children are developing with changes in cognition, psychological and emotional maturity, spiritual and cultural influences, and behavior. The evolving roles of the child and family through illness, end-of-life care, death, and bereavement also influence palliative care provision. Multidisciplinary pediatric teams provide family-centered care, in the setting of the child and family’s choice. Core responsibilities include symptom management, psychological and emotional care, advocacy, and spiritual and cultural care. Advance care planning and decision-making are fluid processes that require attention to the child’s level of understanding, capacity to make decision, his/her role in the family, parental views, and the child’s condition. Due to a low prevalence compared with adult patients, geographical distance, and resourcing limitations, not all children with palliative care needs will have access to a specialist pediatric palliative care team. Care can be provided by general pediatric and adult palliative care teams working together and complimenting each other’s skill sets where there is an absence of a specialist pediatric palliative care team. Research in this area is in a phase of development. Ethical considerations of conducting research in children and with families who are considered vulnerable make study design and recruiting challenging. However, there is a great need for evidence to enable high-quality palliative care provision in this population.